The Alpinestars Monty Boots are a classic moc toe boot with a moto twist. This casual styled boot is packed full of motocentric features like toe, heel and ankle reinforcements, a gusseted tongue and a padded toe that is is uniquely patterned to interface with your shifter. The Oscar Monty Boots are designed to wear every day and are perfect for commuters or urban riders that cannot, or would prefer not, to wear full on moto boots. Finally got tired of giant bulky black bikers boots that HD riders must wear. Bought these based on internet reviews and so far they are great. Light weight, comfortable and can wear to work on casual Fridays when I ride in. I'm not 100% sure they are going to last but so far so good. The toe area was really tight on my feet. I generally need wider toe space. This might not be the problem for most people. The style is great and the safety features were really nice also. They did lack something to secure the laces. I know I could have tucked them inside the top of the boot but for over $200 I expect it to have all the features need for a safe comfortable ride. I'm sure this would be a great pair of boots for someone but they are too narrow and tight on my feet. Comfortable out of the box !!!! I've rode Stylmartin Ace, Rev'it Mohawks, and assorted Made in USA Red Wings, Chippewas, and Thorogood boots. These are the best combo of protection and comfort so far. They feel great right out of the box. They have great traction in my slick garage, ventilate well in the SoCal weather, and have a nice moderate to low profile that gives you no problems reaching under the shifter if you ride a cruiser. I ride a Harley Softail. The Mohawks were CE rated as well, but much warmer in the summer and a bit on the high side. And the Stylmartin Ace boots are not CE rated and have a very high profile that makes it hard to get under the shifter. These are as comfortable, or more comfortable, than a broken in pair of Red Wings. Yet they are a true motorcycle boot with a good level of protection. And they don't look like tech boots. You can wear them around town. I wear 10.5 in Nike running shoes and 9.5 in Red Wings. The 10s fit me perfectly. They are true to size. If you ride in cold weather, or want water proof boots, these might not be your best bet. But for all the cats that live in Cali, the Southwest, and the South, or just want good summer boots for up North, you can't go wrong with these. These boots look like normal black boots but the leather seam on the toe is in a really strange position that makes the boot look weird. The sizing is also off. I read in other reviews that it fits true to size and fits well for D width. I have a D width foot and the boots are crushing my fit from the side. So low score of comfort, style, and fit. Middle of the road on everything else. I was looking for a pair of shoes that I can wear to my office and goes well with smart casual attire. They meet that purpose 100% (the black ones). I am too picky on the design and aesthetics and these shoes score 100% in that area. No shoes I have seen comes close to how awesome these Monty looks. Today is my first day to the office with these shoes and I have already received many comments on how good they look. The fit and finish is near perfect and they are made in Croatia. I have been wearing them since last 6 hours and my feet are not warm but I expect them to become warm in hotter months. I don't think they will ventilate well on and off the bike. The sole is on a stiffer side but not something you cant wear to the malls. I am using my Specialized insoles which has drastically increased the conform straight away. On the technical side, they do not offer full on protection of a race boot but are confidence inspiring for light city rides which is what they are meant for. I buy shoes by length of my foot i.e. 270 cms. This equates to 42.5 in Montys. I found them slightly large say 4-5mm. but with the additional soles in I am good with this size. Really nice boots, but CE2? I bought these boots because I was looking for an attractive boot that wasn't very tall (I live in Phoenix, it's freaking hot), but had malleolus and otherwise good protection. Did a lot of research, and landed with these. They're Alpinestars, they're CE cat 2(!) rated, this must be it. I just got them (in brown), and man they are beautiful. I wear a size 12, I ordered a size 12, they fit perfectly. I've ridden around town in them, and they're super comfy. Perhaps a little warm for me here, being a nice leather with a liner. But... here's the thing. I was expecting some kinda foot-Fort Knox, given that they're darn close to $300, and they have the CE 2 rating. You can buy some serious protection for that kind of moula. The reality here is that the Oscar Montys have some relatively thin plastic malleolus discs, and mildly plastic-reinforced heel and toe that I can easily bend with a single finger. Maaaaaaybe that stuff help if I go down... but I am struck by, in their construction, how much these are very much like the other nicer (non-motorcycle) boots I own (think Frye), and from which I was seeking a protective upgrade with the Oscars. Some of my other non-motorcycle boots might even be a bit more protective, with thicker leather, and equally hard heel and toe cups. So, these are sweet boots, make no mistake, I like them a lot. And I do hope that CE2 rating means something beyond what I can see with my own eyes. I just think that, going forward, this emerging genre, of protective motorcycle boots that don't look so much like motorcycle boots, will have even beefier protection than these puppies do. I'd buy such boots in a heartbeat. In the meantime, the Oscar Montys are what I'm rolling with, fingers crossed. I bought a 12 and I normally wear an 11.5. These fit me really nice with some thicker than normal socks. They are pretty true to size. The leather is nice and the sole has good grip on wet pavement. They are comfortable to wear in the office with jeans all day and I get compliments on them. This is my second pair and I have to admit they are my favorite riding boots. I am a new rider and these are my first pair of motorcycle boots. The comfort and protection of these boots are amazing. I don't have a good reference to compare with other boots but these fit per the sizing recommendations and they are comfortable on the motorcycle as walking around. protection and style all in one. I wanted something fashionable but still protective. These boots look like regular casual boots while offering CE 2 Protection. Obviously these aren't meant for the track or even walking around casually. However it is a perfect medium between the too and looks really good with all outfits. I'm a new rider and I needed boots for the safety class as well as future riding. These boots are very comfortable right out of the box. Now that I've been riding regularly for the past six months, I realize how great these boots really are: durable, comfortable and great style. Because they match the Monty Jacket I have. I wanted a boot with decent protection but didn't look like a dedicated riding boot. I am exploring options and this riding boot is great. It offers substantial protection and durability but it runs a little small though, I actually ripped the tab off when using it to pull the boot on my foot... very tight fit but probably by design. This boot looks sturdy and should satisfy a safety requirement every rider should strive to meet. Best reviews at my price point and style. If I get cold I'll buy some heated socks. I watched Anthony's videos and that helped me narrow down my selection to these. I wanted something casual, but versatile enough for sport/cafe style riding. I chose this boot to wear riding to work. Hopefully I can wear it all day. The comparable Dainese and Rev'It boots didn't seem to get good quality reviews. I have owned Alpinestar in the past, and I hope the old quality still holds true. Also got tired of looking at reviews . . .
Sharp styling. Won't need to carry street shoes in the panniers. protection and style combination, and highly rated. Hard to find boots for my big feet. Does the left boot scuff up easy from the shift lever? BEST ANSWER: Nope, tag says made in Croatia. How heavy are these? Light enough for all day use? BEST ANSWER: Yep. All-day comfortable. Got 'em on right now, while sending this from the office instead of working. Priorities, man, priorities. I just put both boots on the scale and they weigh exactly 3 pounds. I wear these pretty often even when I'm not riding my bike and haven't found them to be uncomfortable the least bit. Just went shopping and was on my feet most of the day and didn't think twice about them. Very comfortable for all day use while still being very sturdy on the bike. I love mine! Thy are relatively light. Not like steel-toes work boots you might find on construction sites which are heavy. These are light enough that I felt I had to check there was actual steel in them. I found them to be quite comfortable but I haven't worn them for long periods walking around a lot, but I don't think it would be a problem. 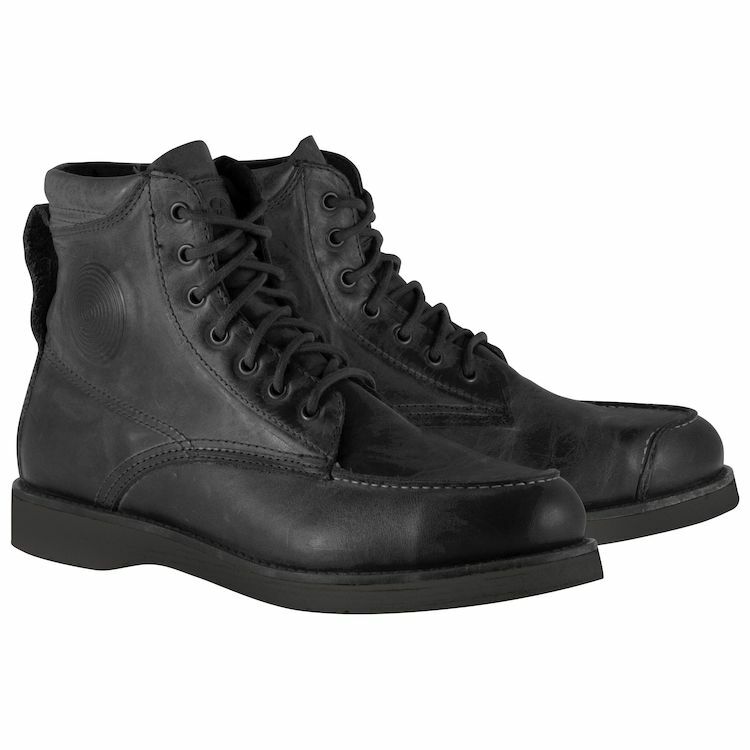 They are light for motorcycle boots due to the soles being much thinner than a work boot. I would NOT plan on walking or hiking in them though. Thick socks or moleskin are a must if walking a lot. I am still breaking mine in so this might change but my feet got sore after a day of walking around San Francisco. They are light enough for all day use. They are lighter than a pair of Timberland Yellow Boots for example, and a great deal lighter than my steel toe work boots. I was actually surprised by the lightness overall. These are very light, actually. I've worn them for a couple of months for (mostly) daily riding, and I love them. I have even comfortably worn them all day after finishing a morning ride. I don't know the exact weight but I wear a size 14 and they are light enough for all day use. I have been wearing them in the office all day for a few months now with no issues. They are very light. I wear them all the time and have not had any issues. I spent a whole weekend in them, just like wearing a normal casual boot. Do these boots have "steel toe?" I work in a factory setting, so it would be awesome if I could ride my bike into work and not have to change into boots? BEST ANSWER: No, they use some form of polymer to reinforce the toe against impact and crushing. They're great boots, but if your job requires actual steel in the toe, as I know some do, these won't meet standards. If you only need some form of rigid toe reinforcement, then these might be okay, although it would be worth checking against OSHA regulations. Personally, even though it means spending more initially, I favor changing from riding-specialized boots to work-specific footwear, especially if you have a locker. It's what I do, although these days my work shoes are dress loafers rather than the heavy-duty (steel-toed) work boots of my youth. Both your sets of shoes will work better longer being used for their intended purposes, and these are pretty expensive for industrial work boots. It does have a protective toe, but I am almost positive that it is not a steel toe. I think it's a hard plastic or something. Reviews seem to indicate that these are true to size. I wear a 9 in most sneakers (Vans, etc) and a 9.5 in Nike. Most dress-type shoes a 8.5. Anyone who can say if these are these sized more in line with dress or sneakers? BEST ANSWER: I had my feet measured at a shoe store before I purchased these. I came out right at the line for 11.5 and D width. The shoes Revzilla sold me as 11.5 are as perfect a fit as I have in any shoe or boot, the best fitting, in fact, of all my motorcycle boots. I can't recommend them highly enough both in terms of fit and feel. Your needing larger shoes in sneakers is probably due to their being too narrow, whereas dress shoes will usually be a D width unless designated narrow or wide. On the other hand, dress shoes are usually recommended to be worn a half size larger if one's feet are at the limit of the size, as I am at 11.5, because of their pointed toes. Based on your description, I would guess the 8.5 or 9 would fit (these really are true to size), but I suggest you go to a shoe store and have your feet measured to know for sure. Buy socks or something so they get some business for the effort. Well-fitting shoes of any kind, and especially motorcycle boots, and especially again boots as good as these are, are worth the effort of a perfect fit. I wear a 10.5 in most sneakers and in boots. I got these in a 10 because I read some comments on the Alpinestars website that their products usually run a bit big. They were a bit tight for me at first but they are not uncomfortable once they got broken in. However I do feel like I will outgrow them in a few months or so. I recommend getting them in your sneaker size just to be safe. Hope this helps. Mine fit spot on. I wear either 10.5 or 11. I got 10.5 for these and they were great, a little snug but not to the point of being uncomfortable. So I would say they are true to size. Anyone know if the soles are replaceable? BEST ANSWER: I have the tan with white wedge soles. Yes, they are sewed, and replaceable. Might be best to contact Alpinestars to see if you can get OEM soles. Otherwise probably will be a generic sole. Having just looked, no wear at all. Try them, they are pricey, but so very supportive and comfortable. For around town, even to work in, these are great. Are waterproof or water resistant?